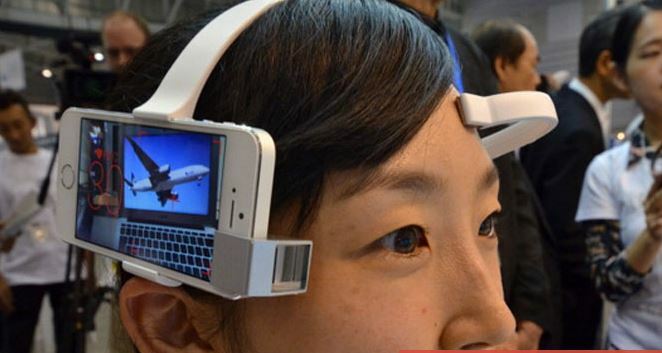 Demoed recently at the Human Sensing 2013 conference in Yokohama, Japan, the system includes a headband equipped to hold an iPhone next to the wearer’s temple. The phone is fitted with a special prism so that the camera can record footage from the wearer’s point of view. The headset also includes EEG sensors that scan the brain for correlative spikes in interest. The Neurocam iPhone app assigns the EEG data a value from 1 to 100. When the data hits 60, interest is detected, which cues the phone’s camera to start recording. Footage is recorded as five-second GIFs, which are then stored in an album so users can remember what exactly struck their interest. So much for being mindful of all that cell phone radiation, now that it’s strapped to the side of the head.